Disney Mobile looks to enhance an iOS and Android classic with the help of some Pixar magic. If you own a smart phone or tablet, there's a great chance you played Temple Run, Imangi Studios' immensely successful mobile game that's been downloaded over 80 million times. We're happy to say it's back with help from Disney Mobile, except the developer exchanged the Indiana Jones vibe for Brave, the upcoming animated film from Pixar, set to arrive in theaters June 22. Said game is Temple Run: Brave, and while it carries a movie license, this promising title retains what made the original a smash hit. Temple Run is all about outrunning enemies while making split-second decisions to quickly turn left, right, jump and slide out of harm's way. 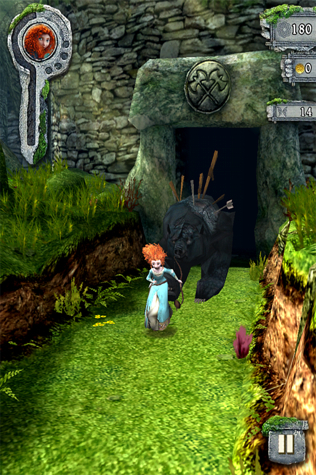 That's essentially the gist of Temple Run: Brave, except you control red headed heroine Merida as she attempts to escape the claws of Mordu, a terrifying bear that has no qualms turning her into a snack. That said, it's your job to prevent this terrible thing from happening by swiping in various directions while also seeing how far Merida can travel without perishing. Sounds exactly like Temple Run, right? Well, a handful of things have changed, starting with archery. Although you cannot attack Mordu directly, you can tap targets that appear along the way, and Merida will instantly fire an arrow in their direction, resulting in gold coins filling your virtual bank account; you'll even find coins throughout your travels. What can you purchase with this newfound cash? A variety of things, including five outfits, three Brave wallpapers and various power-ups. There's a coin magnet that attracts loot, a 250-meter boost and valuable resurrections that give you a second chance. On that note, in-app purchases let you buy more coins, though first-time buyers (the game costs $0.99) receive 2500 coins upfront to spend as they wish. 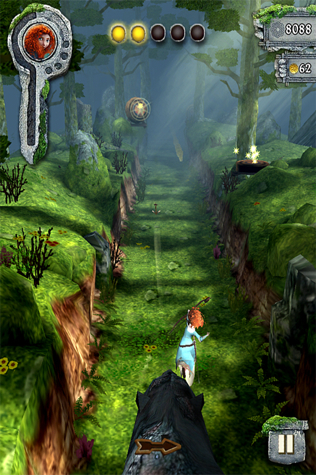 Not only that, but the game looks better than the original Temple Run. Imangi Studios did a nice job adding artwork from the movie, and the jungle features a much higher level of detail. On that note, we don't know if Temple Run: Brave will outperform its predecessor, but considering Disney Mobile's pedigree, we think it'll become one of the more popular games on the App Store and Android Marketplace when it arrives June 14. We'll have a review the week of its release.